I think I first bought and read Jostein Gaarder's bestselling book about philosophy for young people, Sophie's World, when it was first published in English (translated from the original Norwegian) back in the early 1990s. I revisited it for the Convent Book Group's Philosophy theme this month. I did recall some elements of the book, but not the central twist (though I saw that coming). And alas, I had forgotten most of the actual philosophy information which was the whole point of the novel. I have to admit that this time around, I found those sections fairly hard-going -- talk about info-dump! 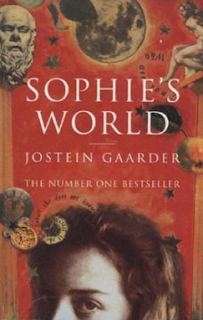 But when the actual mystery/twist part of the book ramps up, I found myself more engaged, and the interplay between the philosophical debates and Sophie's personal situation is cleverly plotted. I'd be interested to know if any young people actually read this book these days. It's a useful primer on the history of (Western) philosophy and much more fun than the textbooks I had to plough through at uni doing Philosophy 101 -- though that's not setting the bar very high! 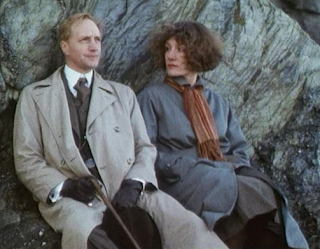 Once again, unable to find a picture of my own copy of Dorothy L Sayers' Have His Carcase, I've stolen an image from the BBC series, which surely shows Lord Peter and Harriet Vane looking for clues on the beach, the scene of the crime. I'd really love to have seen this series, this is exactly how I imagine Peter and Harriet. Have His Carcase comes before The Nine Tailors, but I forgot it was tucked away on my shelves. Now this one I remember well -- I must have re-read it a few times, and I remembered the twist at the end perfectly. The series does catch a new lease of life once Harriet Vane appears, and I really enjoy the interactions between her and Peter. The key is that they WORK together so well; they respect each other's intellect as well as fancying each other, and they obviously just enjoy each other's company -- not a bad romantic model. (This from someone who married her boss -- ahem!) I love the way Peter clearly adores Harriet ('By the way, will you marry me? '), and she briskly fobs him off ('No, thank you'), though there is a lot of angst under the surface which we are only allowed to briefly glimpse -- no wallowing here! (Peter has previously rescued Harriet from a false charge of murder, thereby saving her life.) Of course Harriet is a stand-in for Sayers herself (a novelist of detective fiction, no less) but who cares. Lots of confusing stuff about ciphers and alibis, which is slightly better than train timetables, but it's the relationship between the sleuths that holds this one together. One of my most memorable panic attacks struck on my first day alone in Paris. I was staying in the back two rooms of an apartment kindly lent by a family friend, in an otherwise deserted house, and a seemingly deserted suburb (everyone in Paris had departed for summer holidays). It was hot, I couldn't speak French, I was tired and under-nourished and scared. I ended up sitting on the bathroom floor (I couldn't open the shutters in the only other room), eating tinned peas with my fingers and drinking orange juice. Sometimes I tell this story on school visits, and I do my best to make it amusing. I threw up peas through my nose! And the moral of the story is, no matter what a crappy experience you're enduring, you can always use it in your writing. But at the time, it wasn't funny at all. I was terrified. I didn't tough it out. The next day, I fled back on the ferry to England and the safety of my aunt's house. Instead of tramping the youth hostel circuit, I went camping in Wales with my cousins, and waited to do the backpacking thing until a friend arrived from Australia to keep me company, and hold the anxiety at bay. 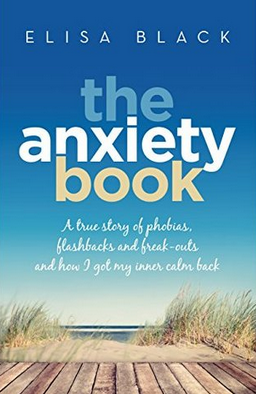 Looking back, I see that I've suffered from anxiety all my life. All the signs were there, I just didn't put them together until recently. I vomited before every exam and elocution performance. I felt sick before every major decision. Under stress, I always threw up or sometimes fainted: twice in hospital rooms where my loved ones were under threat. When I realised that the sick feeling, the formless dread, was there in the pit of my stomach every single day, I started medication. I took up yoga, and knitting, and piano. Things are better now. Anxiety and depression run through both sides of our family. Four out of five members of my household are currently taking some kind of medication to suppress it (and it's probably just a matter of time for the fifth). So reading Elisa Black's memoir of her own struggles with "phobias, flashbacks and freak-outs" covered some very familiar ground. Black's book switches between her own personal journey and a chatty, accessible account of the latest treatment options and stories of others' experiences. In the end, the message is one of hope and encouragement. Black's demons haven't entirely disappeared, but she has them pretty well under control these days. With help, therapy, medication, meditation, exercise -- whatever works for you -- you and I can get better, too. 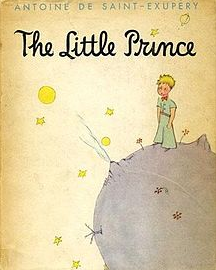 Antoine de Saint-Exupery's The Little Prince is one of those classic children's books that is probably more popular with adults. Its romantic allure is enhanced by the fact that the author, a fighter pilot, was killed in action during WWII, not long after writing it. Saint-Exupery was primarily an essayist and writer for adults, but The Little Prince has proved to be his enduring legacy, with an animated series and countless translations. We are reading it for the Convent Book Group, under the theme of Philosophy. Can I make a confession? Not really a fan. I won a copy, picked up cheap at a library book sale, because it is a classic and I felt I ought to have it. But it just doesn't do it for me. Twee. Sentimental. Vaguely misogynist. I find the illustrations just badly drawn rather than naively charming. Him and his devotion to his bloody rose and his volcanoes and his boababs. It's all a bit try-hard for me. It comes across as a book written to order, by a publisher who said, hey, Antoine, why don't you write something for kids, mate? Something whimsical yet profound? Which is exactly how it happened. 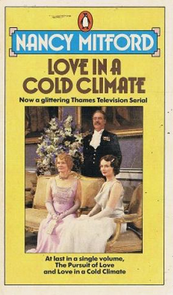 One of my favourite books of all time, I've read Nancy Mitford's Love in a Cold Climate (and its predecessor, The Pursuit of Love) so many times that the pages have acquired a soft, worn texture, almost like cloth. I haven't read them for a long time, though. I decided that A might enjoy a dose of Mitford, as I was about her age when I fell in love with her books, so I started reading her The Pursuit of Love. But she found Davey Warbeck irritating, and when she realised that the children grew up and married, and didn't spend the whole book being hunted across country by their father, she lost interest. However, she has required my company while she studies from time to time lately (it's the SAC time of year), so I took the opportunity to reacquaint myself with the story of beautiful Polly, terrifying Lady Montdore, creepy Boy (aka the Lecherous Lecturer) and flamboyant Cedric. Reader, I remembered almost every word. It was like sinking into a deliciously scented, decadent warm bath with a bottle of champagne and a box of chocolates on the side: pure, slightly guilty delight. I know from reading her letters that Nancy Mitford worked hard on her novels, but they read as if they were effortless, like an amusing, politically incorrect friend telling you an endlessly entertaining story. Mitford might be an acquired taste, but she has sunk into my reading DNA and I doubt I will ever be able to dig her out. When I last read Dorothy L Sayers' The Nine Tailors, I had no idea what the art of change-ringing was, and happily allowed all the novel's complicated references and descriptions sail over my head. These days, thanks to Google, I was better able to inform myself. 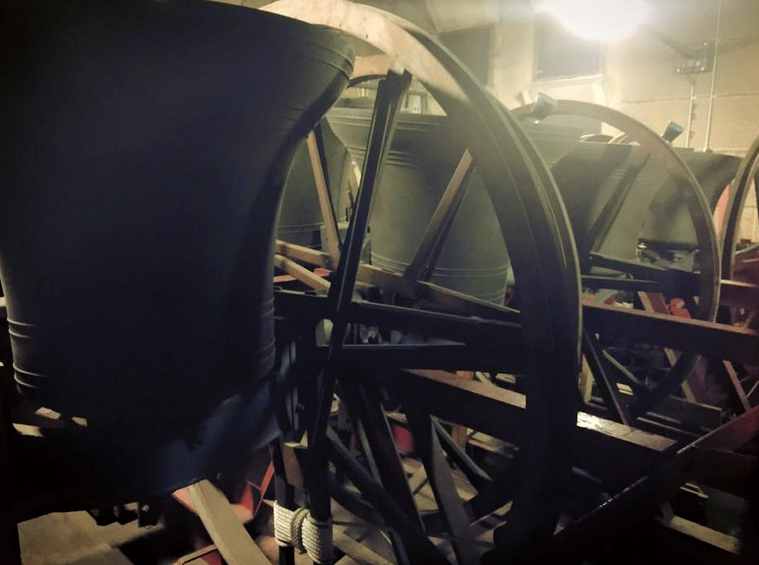 Change-ringing involves ringing a set of bells in an ever-changing sequence -- it's more to do with mathematics than music, running through every possible permutation of the order in which they can be rung. To me, the ringing of church bells is one of the most glorious sounds in the world: I cherish the memory of hearing bells ring out on a cloudless autumn's day in Avignon. But apparently change-ringing is a particularly English obsession! This is perhaps the ultimate 'cosy' English mystery, centred on a country church in the fens of East Anglia. (As an aside, I note that Kevin Crossley-Holland's Waterslain Angels, which also featured cherubim on -- along? under? -- a church roof, was likewise set in the Fens. Is this a peculiarity of East Anglian churches? Google has thus far been unable to answer this question.) Several volumes in to the series, Lord Peter has thankfully shed most of his annoying mannerisms and become good company, though he has acquired yet another improbable skill to his repertoire -- he is an accomplished (though rusty) bell-ringer, as well as an amazing cricketer, expert on old books etc etc. But I forgive him. I think I must get my hands on Strong Poison. Perhaps Harriet Vane has already mellowed him? Also I want to read Murder Must Advertise, which has a cricket match in it. Lots of catching up to do! *The nine tailors, or nine single strokes of the bell, are tolled to mark the death of a man. For a woman, it's six. Another Dorothy L Sayers title from my Peter Wimsey omnibus, The Five Red Herrings is set in Scotland, and we are never allowed to forget it for a moment! 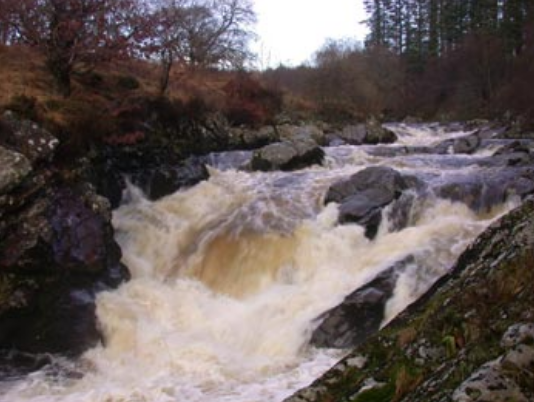 This is a picture of the river where the body is discovered, the Minnoch, where the unfortunate victim seems to have tumbled down a bank while painting the scenery. But it soon transpires that foul play is afoot, and the presence of a half-finished painting on the easel suggests that the murder could only have been performed by a fellow artist. The five red herrings of the title refer to the six other artists in this little community, all with motive, opportunity and wonky alibis (of course, one of them is no red herring, but the real deal). I must admit I struggled with this novel at first -- I've only read it once before, as a teenager, and I remember feeling inordinately proud of myself for spotting the first vital clue, thus proving myself to be the 'intelligent reader' referred to by Miss Sayers, who would guess what was missing from the crime scene. I do adore Scotland, but the constant rendering of dialogue in dialect became a little distracting. "She's troubled in her mind aboot Mr Farren. And nae wonder, wi' him mekkin' a' that disturbance and gaeing aff that gate an' never comin' back for twa nichts." Eventually I relaxed into it, but it took quite an effort at first! And in the first third of the novel, there was a LOT of guff about bicycles and train tickets and timetables that I frankly couldn't be bothered to keep track of, though it was significant in the end. I also (dear me!) had trouble telling our six suspects apart. So, not my favourite Wimsey, despite the alluring Scottish setting. But it did come home with a rush, and a most entertaining re-enactment sequence, which made up for its other shortcomings.